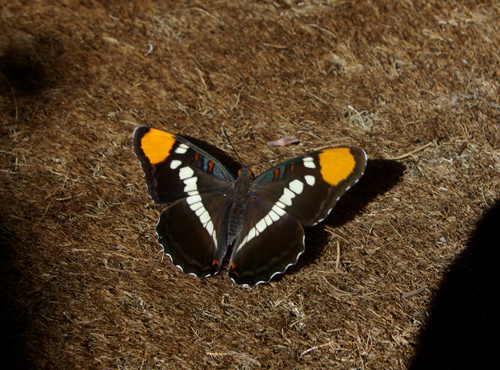 This butterfly journal goes back a bit in time to summer before last when the above California Sister (Adelpha californica) showed up on my front doorstep. Somehow the arrival of this extraordinary butterfly marked a turning point in my attention, as up until then while I admired butterflies I knew little of them in actuality. And this would still be true. But I am learning. And this year, in particular, I am researching those that show up in my world. And I love it. Here are the few that I’ve been able to photograph and research a bit. Please join me in my explorations and we shall learn together! Apparently the most common butterfly in the country is the Cabbage White (Pieris rapae) and frankly, though sympathetic to those trying to grow large patches of food, specifically those that serve as host plants to the poor Cabbage White (you probably know them: cabbage, obviously, cauliflower, mustards, kale, etc. 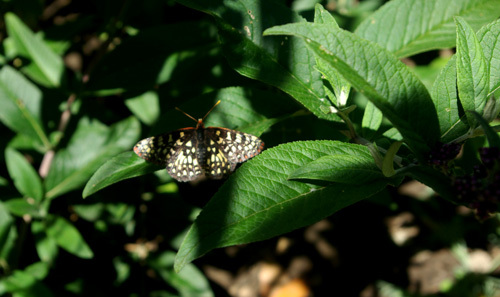 ), I find this simple small white butterfly one of the most charming visitors in my garden. Why? Because they dance and they dance with each other. 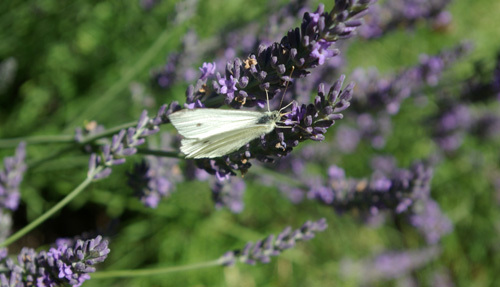 The word “flutter” was designed perfectly for the Cabbage White. They move so quickly and so erratically, signaling to any would-be predators they are not worth the bother it would take to chase them down, that they are inordinately hard to photograph. 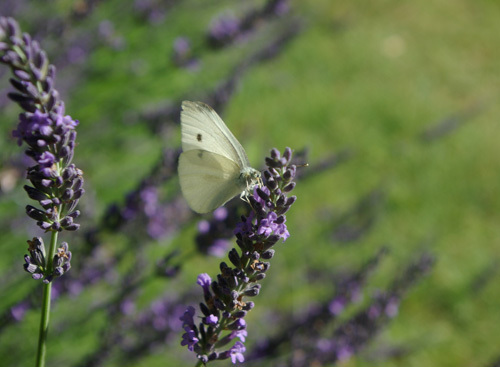 After dozens of frames of out of focus butterflies I at last was able to catch the little girl [two spots; males have one] above for a split second on a stand of lavender. She even kindly afforded me two, bless her heart. And while you cannot see in this reduced size I will swear to you that in the first photo it appears that she is actually turning her head and sizing me up. I really think that’s what I’m witnessing and it’s quite amazing, actually, to think that might be true. But about the dancing. What I find most enchanting about the Cabbage Whites is their habit that in encountering another of their kind they immediately engage in a frivolous circular dance around each other, tumbling through space for some few seconds, and then disengaging and going their own way. And they do it all day long. Now I’m certain those in the know would point out to me that this is some kind of male-female interaction that results in birds and bees activity, but to date I’ve only witnessed the joy of the dance and I’m going with that, for that is what I see. Over and over again. And it is beauty. I’ll take it. Cabbage Whites made their way to America from Europe in about 1860. By 1883 they are recorded in California though apparently it’s not known if they were introduced by the Spanish from the South or if they made their way from New England. A word to the Cabbage White trolls: I have borne witness to the fact it is possible to grow large quantities of a particular vegetable organically without dumping chemicals on butterflies. How much can they eat? Grow enough for them. Ditto in your own small gardens. 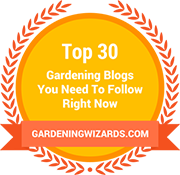 Perhaps by introducing nasturtium or other host plants they would opt for that rather than your veges. Just sayin’. Chemicals designed for the Cabbage White take out other beloveds, too. Thank you! 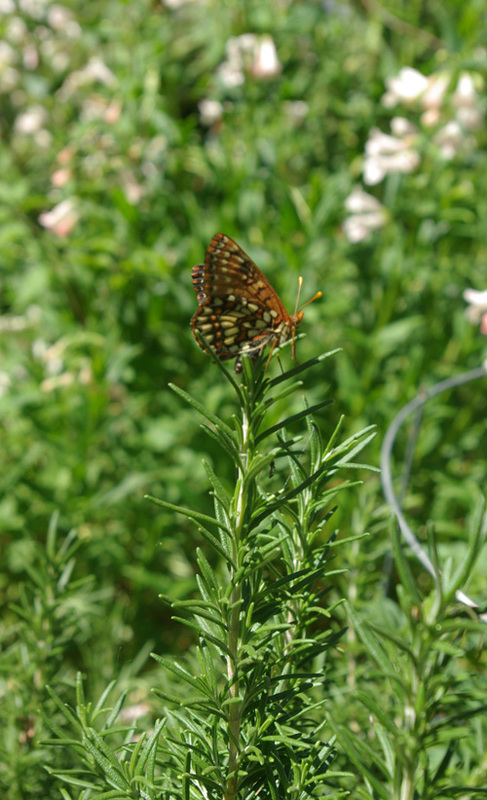 Once the butterfly bushes opened their beautiful blossoms my garden began attracting the Variable (or Chalcedon) Checkerspot (Euphydras chalcedona) which I had never seen in this garden before. The one above, sadly, was missing one of its four wings. It flew about unminding and landed gently in my large rosemary bush, allowing me this side view. Perfect. 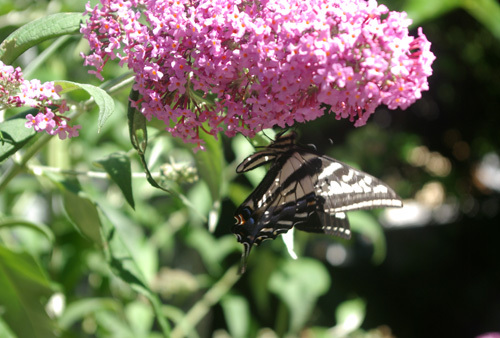 Happily, a second one came the next day, attracted to the butterfly bush. Now firmly on their circuit, apparently, a third came and landed in a second butterfly bush and remained perfectly still for at least five minutes, allowing me this view. Notice this one is darker, but I have read there might be some variation in darkness. 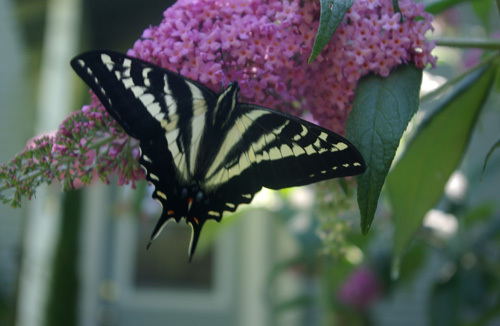 Undoubtedly the most beautiful of all the butterflies who come to my garden are the Western Tiger Swallowtails (Papilio rutulus) and, thankfully, they come daily in abundance. Here are some of my most special moments in their presence. Enjoy! I loved this photo of the underside of just the tail of a Western Tiger Swallowtail. I find myself wondering about its evolutionary design, certain that to some possible predators that tail design would speak to something much larger and possibly more dangerous than the butterfly actually is. Smart! There have been other butterflies in the garden, mostly skippers and blues. Can I manage yet to photograph them? No. Sadly. But I will rise to the occasion as I learn the nuances of learning to photograph them. I will. And I will share with you as I do. Looking forward to your comments and hearing of your own butterfly experiences! See? Much more yellow. 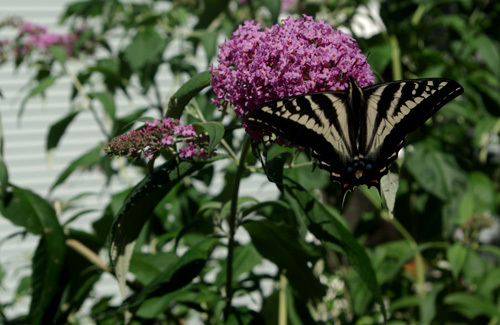 As if this were not enough to convince me the one in my current post is actually a Pale Tiger Swallowtail, a very yellow Western Tiger Swallowtail showed up in my butterfly bush yesterday. She didn’t stay long enough for me to photograph, but I got the point, and thank you for that visit! 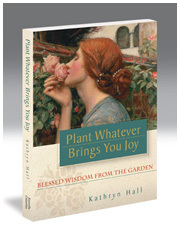 Book News: Dig-It Magazine will be reviewing Plant Whatever Brings You Joy: Blessed Wisdom from the Garden in their September issue. This week I have been adding some new photos to the slide show at Estrella Catarina. 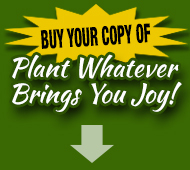 Also, the Kindle version of Plant Whatever Brings You Joy is now available on the German Amazon site! 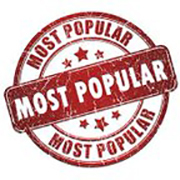 Link added on Estrella Catarina. Do stop by and enjoy! Thank you so much! I recently discovered your website and just love it. 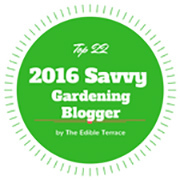 I share the same passion as you do for the love of the garden and all the little flying visitors I get everyday. It just amazes me that the feelings and thoughts I get when I walk around my garden are expressed in your writing. 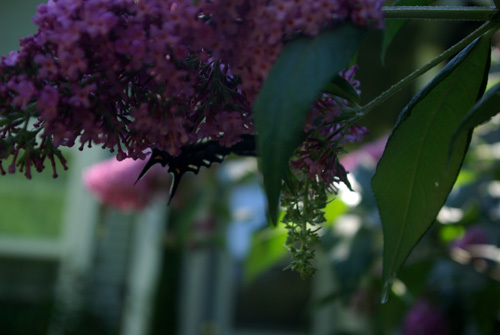 I wish I can show you my photographs of the same 3 shots you have of the swallowtail atop the butterfly bush only my butterfly is more yellow, I guess that would be the eastern version. Nice to know that the little dancing white butterflies are called white cabbage. I’ll try to photograph them while they play in my garden. I think they like tomato flowers too. Thank you for putting my thoughts into beautiful words. Lovely post, mom! You have described the dances so beautifully! 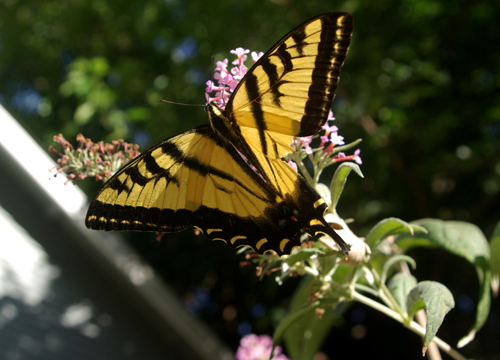 I feel blessed to have an abundance of Swallowtails, and other varieties, in my yard. They’re wonderful to watch fluttering about. Do you know if there is any plants that I could put in containers that would attract butterflies? MORE PUZZLE PHOTOS. THANKS, KAY! 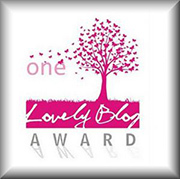 Beautiful post!! Butterflies are special creatures that we need to help encourage their survival. Thanks for the post, love it. I love these butterflies. Well the swallowtails are not common in our southern plains here but white cabbage is a common sight. I really enjoyed the post indeed, a source of pure joy. I have a long h istory with Monarch butterflies. We have collected the cata pillars from milk weed and enjoyed the miraculous transformation to butterfly often over the years . I did it as a child, my children, and my grandchildren have had the joy. God transforms us also and the butterfly is a beautiful metaphor. So this plant is rightly called butterfly bush.I am going to purchase one after having seen all these pix.I miss butterflies seriously.I remember when I was young I used to see alot of them around.Sadly, they’ve completely disappeared during the last 2-3 years.Only a few to be seen in Spring. You have a lovely website which I discovered while on a “research trip” this morning. I am writing and illustrating a book “The Walnut Grove” and want to include a butterfly on my cover, but I couldn’t decide which one. When I was a little girl growing up in southern California in the 1950’s there were butterflies everywhere! The last time I saw a Tiger swallow tail was last December! Keep up the good work! I respect other’s copyrighted material and though I’m not copying anything of yours, but I’d be happy to include your name and site in my list of acknowledgements if that’s alright with you.